SkyDrive Desktop let's you view, upload, and delete files on your Windows SkyDrive from your computer. This article talks about two different tools that help you access SkyDrive. SkyDrive-desktop integration is now possible using third-party tools. With SkyDrive-desktop integration, you can now upload files to the Windows SkyDrive without having to use a browser. Windows SkyDrive is a cloud service from Microsoft that allows you a whopping 25 GB of free storage space. This article talks about two third-party tools (none of them developed by Microsoft) that help in integrating SkyDrive with your desktop. These tools work well and blend into the Windows Explorer. The SkyDrive Explorer is a nice tool for SkyDrive and Desktop integration. 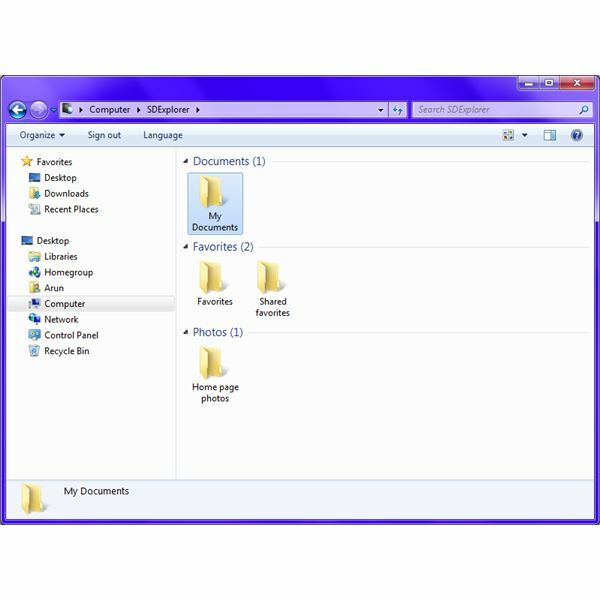 When you download and install SkyDrive Explorer, you can view, upload and delete files on your Windows SkyDrive without having to use a browser. You do need an Internet connection, though. 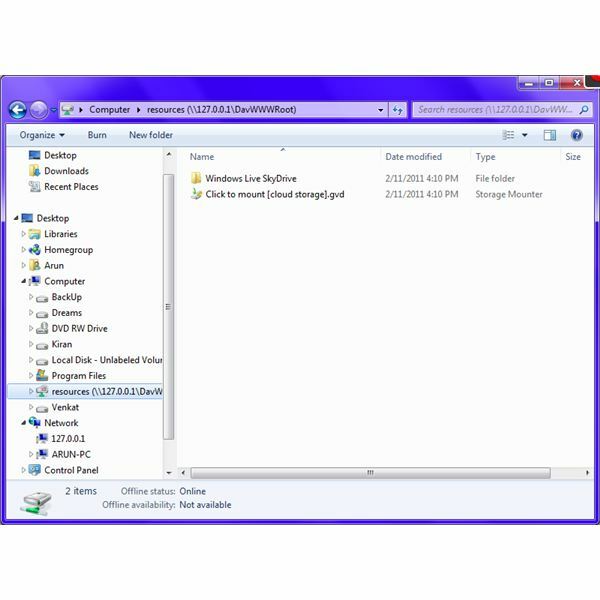 The SkyDrive Explorer acts as a plugin to your operating system (Windows) and appears under the "Send To" option in Windows Explorer when you right click on any file or folder. As you perform all these operations from your SkyDrive desktop, you can feel the difference in speed (when compared to operating through a browser). The only problem in integrating SkyDrive with desktop using SkyDrive Explorer is that it will not appear as a separate drive in My Computer or Windows Explorer. You have to start the program by clicking on its icon. Once clicked, it opens the Windows Explorer with SkyDrive root contents allowing you to browse from there (see image). However, you can always right click on any file (without opening the SkyDrive Explorer) in the Windows Explorer and right click to send it to the SkyDrive (applicable to Pro version only). 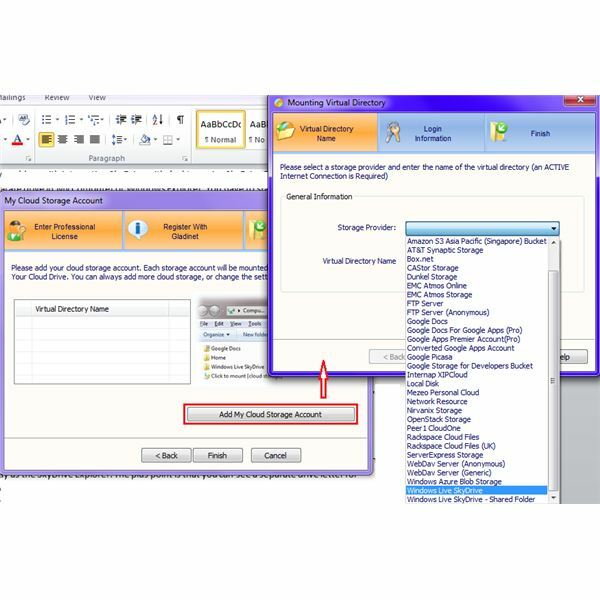 Another SkyDrive desktop integration tool is the Gladinet Cloud Desktop tool. This tool also works in the same way as the SkyDrive Explorer. The plus point is that you can see a separate drive letter for Windows SkyDrive in your Windows Explorer or My Computer. Thus, you do not have to click on the program icon to use the Windows SkyDrive from your desktop. Once you click the SkyDrive icon under in Windows Explorer, it shows your SkyDrive folder and another icon that allows you to add a different cloud service to Windows Explorer. Double click on the SkyDrive icon to open it (the root folder of SkyDrive). You can browse from there to copy, rename, or delete files/folders on your SkyDrive. You can also right click on any file or folder in Windows Explorer or My Computer to select "Send To" and then "My Gladinet Drive" to copy the file(s) to SkyDrive. 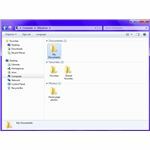 These were two SkyDrive desktop tools that allow access Windows SkyDrive from your desktop. They also add speed to your file operations. I would say, on a personal note, that the Gladinet Cloud desktop offers a better experience than the SkyDrive Explorer. Check it out. This series on Windows SkyDrive aims to offer you complete information on the cloud storage product from Microsoft. SkyDrive is more than just a remote storage. This series assists you figure out what all you can do with Windows SkyDrive. Is Windows SkyDrive Better Than Google Docs?